After a terrible accident, Tessa returns to her family beach house to heal. She doesn’t expect to see her first summer crush from seven years before. Cameron, though, reappears and ignites a relationship that’s far more intense than ever before. The only problem? Summer is once again coming to an end, and this time, Tessa will have to decide whether to choose life with Cameron or to never see him again. Under Poseidon’s rule, Circe is the most destructive siren in the Pacific ocean, her songs luring ships and their crew to their watery graves. Not Otis, the best halibut fisherman in the Alaskan waters. His ship, the Calypso, has avoided disaster each time Circe set her sights on him. Given one last chance to deliver Otis to Davy Jones’ locker, Circe takes to land to waylay the handsome captain. Instead, it may be Otis himself who hooks the Siren. Should Miki choose to wed the local wealthy boy she doesn't love, her stomach will stop grumbling. Her soul, however, will suffocate. With one last opportunity before she must concede, she sneaks off for a final dive to her hidden crate at the bottom of the seabed. What waits for her is more than a captured lobster. It's a treasure she cannot claim without great sacrifice or true love. Nixie, a water sprite, lives a solitary existence as she struggles to understand the strange world beyond her waters. When she meets one of the pink ones, a curious boy named Wyatt, their friendship blooms into a love that can exist only upon the sands that divide his solid ground from her underwater paradise. Some love, though, once born, cannot be undone, even in the face of death. 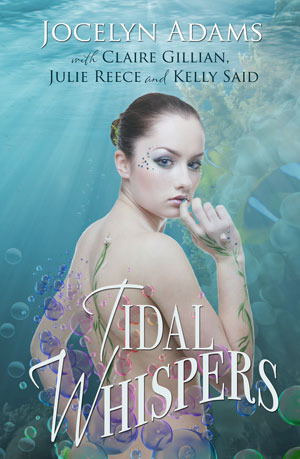 Tidal Whispers is an anthology filled with amazing writers and their enchanting sea creature themed short stories. Julie Reece, Claire Gillian, Kelly Said and Jocelyn Adams really prove their writing skills by challenging readers' knowledge of creatures of the sea. These four short stories are nothing short of exquisite and each story has it's own special ability to highlight love in the most unexpected places. Heart's Desire is my first look at Julie Reece's writing, which is absolutely brilliant. She tells Tessa's story with vivid and romantic words that make me feel like I'm walking the sandy beaches right along with her at sunset. Reece is so in tune with building up the scene without directly telling readers what's going on; I never felt like she was just handing the story to me, but allowing my imagination to kick and get the full effect of her words. It seems almost impossible to feel so much love flow out of a short story, but Julie Reece captured my heart with her vulnerable, flawed Tessa and the dark, mysterious man of Tessa's dreams. The Sweetest Song is the sweetest story of this anthology. Claire Gillian gives readers characters so gentle and determined that it's easier to savor every sweet drop of their triumph. Otis and Circe certainly do not have a normal relationship, but somehow they weather the storm and make the perfect match. Gillian's portrayal of Poseidon is unique and surprising. I've never pictured Poseidon to be a over-indulged first class jerk, but I guess there's a first for everything! This story kept me on my toes. Pearl of Pau'Maa begins by laying out Miki and Harmon's individual situations. It didn't feel like a romance right from the start until the significance of the Pearl of Pau'maa was revealed and the main characters collided under the rough waters of the sea. There is definitely more action, but once the story rolls to the love and heartfelt expressions it shines along the same theme as the other short stories. The Undergarden is by far the most heart wrenching of Tidal Whispers. The story progresses from cute to intense as Wyatt and Nixie are introduced at a young age and grow up through confusing times. Jocelyn Adams really knows how to throw down when it comes to story-telling and The Undergarden showcases her talents magnificently. I loved how curious about life and the 'pink ones' Nixie was; it just made certain parts of the story seem more open because of her innocence and sincerity. Adams' short story was completely the right choice to close the anthology! Add TIDAL WHISPERS to Goodreads.